Like the films they soundtrack, Quentin Tarantino’s musical selections are schizophrenic mash-ups that somehow work well together. Since Django Unchained is about a slave turned bounty hunter, expect Spaghetti Western samples, some classic R&B, a bit of country and some delightfully profane clips of dialogue. The most prominent songs on the soundtrack are those from other films. Selections come from the Westerns Django, Two Mules for Sister Sara, Lo Chimamavano King, The Hellbenders, and They Call Me Trinity. Composer Ennio Morricone’s work features heavily, and he collaborated with Italian singer Elisa Toffoli on an original track for the film, “Ancora Qui.” These songs largely set the mood for a quest, with their dramatic vocals and steady acoustic melodies. Working seamlessly with these themes are the folk-infused selections. Jim Croce’s “I Got a Name” is particularly relevant given Django’s status as a former slave establishing himself as a free man, and Brother Dege’s outlaw track, “Too Old to Die Young” emphasizes the danger involved in Django’s journey. But Tarantino would never make a movie about an African American character without bringing in rap and R&B. Rick Ross’ “100 Black Coffins” features rapping and a digital beat over the typical slow guitar and whistling of a Spaghetti Western track, fusing the styles cleverly. Likewise, the choice to combine “The Payback” by James Brown and “Untouchable” by 2Pac with some of the film’s dialogue is inspired, as the horns from Brown’s music fit in well instrumentally to tie everything together. Sensitive sorts might be offended by the clips from the film since they feature, well, liberal use of certain antiquated, racist language. But that’s part of the movie’s authenticity. Then again, if you’re easily offended, would you be checking out Tarantino’s work at all? 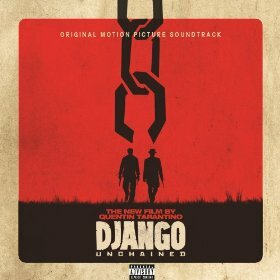 Django Unchained is a powerful piece of cinema, and the soundtrack is energizing, eccentric, and absolutely entertaining.